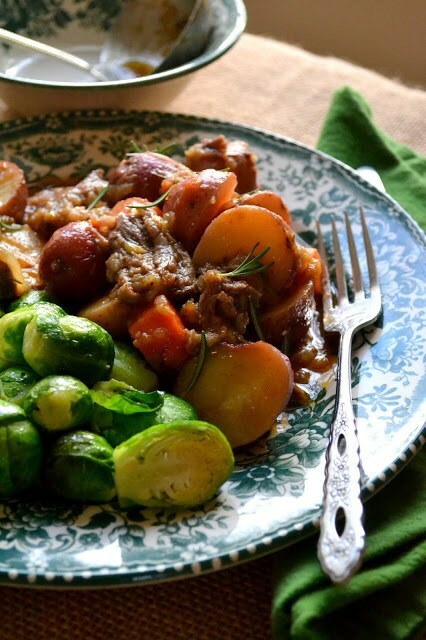 Irish Whiskey Short Rib Stew with Brussels Sprouts ~ a traditional Irish stew straight from the corner pub! Make it for Saint Patrick's Day or an everyday family meal, it's stick-to-your-ribs delicious. Trim any excessive areas of fat from your ribs. Sprinkle them with salt and pepper, and then dust all over with flour. In a large dutch oven heat the oil and shortening until hot. Brown the ribs well on all sides, then take them out of the pan and set aside. In the same pan, saute the onion, shallot and leek for a few minutes, until softened. Take the pan off the heat, pour in the whiskey, and then put the pan back on the heat to let the whiskey come to a boil. Let it reduce for a minute, scraping up the brown bits from the pan, and then add in the tomatoes, the tomato paste, the stock, the bay leaves and fresh rosemary. Bring it up to a simmer, and then cover the pan and put it in the oven for 3 hours. An hour before the ribs are done, add the potatoes and carrots. When the stew has cooked for 3 hours, remove the vegetables and meat. Remove the stems of rosemary and the bay leaves and allow the sauce to cool. Remove the layer of fat that rises to the top. If necessary, if there is an excess of sauce, you can reduce it by boiling it on the stove for a few minutes. Shred the meat off the bones. Add the meat and vegetables back into the sauce. Bring back up to a simmer. Check the seasoning, and serve along with the braised Brussels sprouts. Garnish with more fresh rosemary. To make the Brussels sprouts: halve the sprouts. If they are very small you can leave them whole. If they are very large, quarter them. Heat the oil and butter in a saute pan and add the sprouts to the pan, along with 1/4 cup water. Cover and let the sprouts simmer/steam for a few minutes, just until they start to soften. Then uncover the pan and let the liquid evaporate. Season with salt and fresh cracked black pepper. They should be firm and bright green.